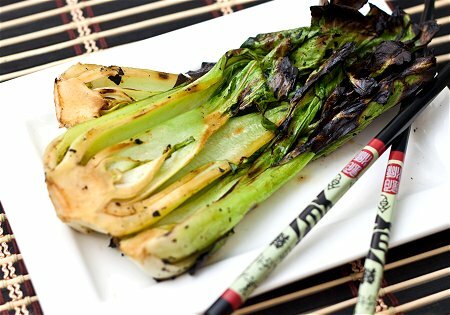 Grilled bok choy is one of my favorite vegetable side dishes. I usually cook it when we’re putting something on the grill anyways – steak, chicken, kabobs. Often I’ll just keep the seasoning simple – olive oil, salt, and pepper. But, whenever I want something a little more special, I made a wonderful spicy Asian vinaigrette to go on top before grilling. Some people steer clear of bok choy because it falls under the cabbage category. If you think you don’t like cabbage, give this recipe a try. I too, was a “cabbage hater”, but bok choy really brought me around. It’s a very mild flavor, so it’s a great place to start. Feel free to play around with the flavorings in the vinaigrette too. I like the flavors that the soy sauce and Sriracha lend, but just most things in the kitchen, the possibilities are endless! I like to use baby bok choy if I can find it, because it cooks so quickly and is tender. Large heads of bok choy will work as well, but you should quarter them before grilling. Preheat an outdoor grill for medium-high heat for 15 minutes, and lightly oil the grate. In a small bowl, combine the soy sauce, sesame oil, Sriracha, and black pepper. Slice the bok choy in half, lengthwise. Brush the cabbage with the soy sauce mixture on the cut side, letting the vinaigrette fall into the grooves. Lay the bok choy on the preheated grill, cut side up. Cook until the stalks show grill marks and the leaves are crisp at the edges, about 2 minutes. Turn the bok choy, brush with remaining soy mixture, cover, and grill the other side for about 2 more minutes. Remove to platter and serve. Amazing! Just tried this… so easy & soooo good! This is the best marinade for veggies ever … I use it on everything!! !